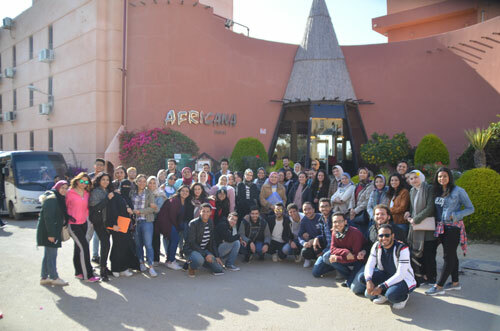 The Architectural Engineering Department at the Faculty of Engineering – Pharos University organized a field trip for the third year students to Hilton Kings Ranch and Africana Hotels on Wednesday 27/2/2019. 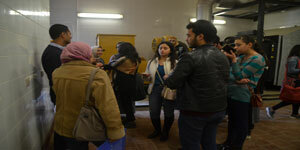 The coordination of the trip was managed by Prof. Dalia El-Serdy, Dr. Mona Naguib, Dr. Mona Salem, Eng. Nesrin Aiad, Eng. Amany El-Masrawy, Eng. Hagar Nagy and Eng. Monica Heshmat. In their visit to Hilton Kings Ranch Hotel, the students were escorted in a tour towards reception area, restaurants, cafeteria and hotel rooms; suites, single and double rooms. They were also acquainted with the drainage ducts, electrical rooms and furnishings in every floor, the swimming pool, the spa resort and the building of mechanical and electrical rooms including generators and machinery as well as the parking lot. During their visit to Africana Hotel, the PUA delegation were escorted around the reception area, restaurants, cafeteria and varied hotel rooms; suites, single, double and triple rooms. They were also acquainted with electrical rooms and furnishings in every floor, the swimming pool, and the different levels of the general site and all the rooms have a view of the Mariout Lake.